We propagate a wide range of riparian, heathland, woodland and grassland species that are native to the Mount Lofty Ranges and surrounding areas. In particular, we specialise in Xanthorhoea semiplana (Grass Trees), which are available in a number of sizes. Download our current list of plants. We can grow from locally sourced seed that we collect or from seed that you provide. We grow a wide range of species to suit any revegetation or landscape project. All plants are grown on benches raised off the ground in our purpose built enclosure that provides protection from birds. We can grow to a range of container sizes. We aim for quality products and have found success with our method of growing in square native tubes 50mm x120 mm with air pruning trays. Sedges are grown in cell trays. We have the capacity to meet the needs of your project in terms of species, quality and pot size. 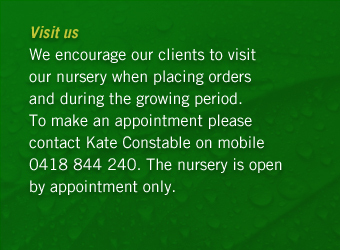 We specialise in plants native to the Mount Lofty Ranges. Xanthorrhoea semiplana are available in a number of sizes.